The proposal is to build a kitchen extension on the rear and side of a Victorian terraced house and open up the kitchen area for easier access and better light as the owners work from home and one has to use a wheelchair occasionally. This will require the demolition of an outside W.C. Presently the kitchen and dining room have a dark and introspective aspect, which does not have views onto the back garden nor the amenity of sunlight that it could offer this family; who often use the kitchen and work from home. The clients would like to open up the presently dark kitchen and convoluted space (in terms of access) by removing the existing outside W.C. structure at the rear, build an extension and fill the disused path along the side of the kitchen. This will allow them to create an open glass façade onto the garden, which when combined with a side extension will create a good sized space for the family and friends to meet and to work from and to have the amenity of sunlight and access to the garden and within the kitchen itself. Here, the back garden ground level at 32 Heathwood Gardens is some 300mm below the ground level of the neighbours’ garden, at 34 Heathwood Gardens. The boundary fence is also 2300 high from the ground level at 32 Heathwood Gardens and there is presently a trellis on top of this. So if a side extension were to be built to the same ceiling height as that which exists in the kitchen it would not, even including the roof depth, exclude any light or views- due to the height of the timber fence and the lower level of the ground floor. Also the clients wish to lower the ground floor so as to be level with the patio. This kitchen extension will be accessed primarily via the entrance hallway corridor, via a proposed storage wall of full height cupboards for storage and past a W.C. and utility area. There will also be access via the dining room, where the existing sash window will be opened up to create a doorway. 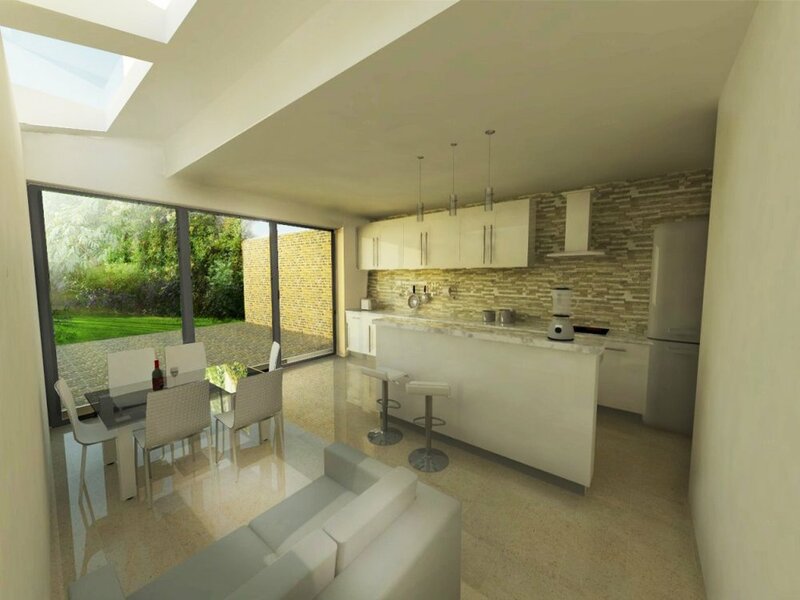 Access to the garden will be directly through the kitchen through two sliding doors that will be offering an open sense of space when fully opened. The extension is designed in such a way as to create a light-weight feeling both internally due to the light and open space it will provide and also externally due to the maximum use of glass and minimal use of brickwork. There will be three Velux windows with blinds set into the flat roof at the side. The brickwork that forms the wall and supports at the rear will be kept to the minimum of simply the two flanking walls and bridge, within which will be columns to support the façade’s beam that will support simply three courses of brickwork. In this way the openness of the façade will be maximised and have a light-weight feeling with a horizontal emphasis. This horizontal composition is enhanced by the sliding doors that have a more square-ish character than the alternative, which were five vertically set bi-folding doors. There is a parapet that is proposed to cap the rear façade but not the side, because on the side the proposal has been designed to keep as low as possible. When the horizontal composition of this brick façade and parapet is combined with the open character of the glass- the whole creates a modest impact on the house’s rear arrangement and helps the extension to be in-keeping with the character and scale of the existing house and terrace; without it becoming over bearing. In addition to the use of the horizontal composition and the openness of the sliding windows, the proposal will use brickwork to match the existing brickwork in order to stay in keeping with the existing house. This brickwork will be second hand London Stock brickwork that will have the same pointing as the existing; and if needed will be stained to match the existing brickwork. The roof of both the side and rear parts of the extension will be of lead-work. The horizontal element of the parapet banding, will be of stone or reconstituted stone. The gutter will be of galvanised grey painted pressed metal and will need to be set onto the side wall in order not to block any rights to light that the neighbours at 34 Heathwood Garden have. 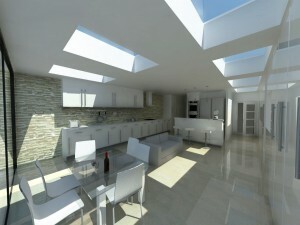 The skylights in the side extension roof will be timber framed central pivoting “Velux” windows. As this well-used family house often has more than four people visiting and/or living there, the kitchen is often overcrowded and the dining room blocked off from the kitchen and garden. This extension will improve access in and around the rear of the house and garden – that is presently difficult to access and not seen at all from the kitchen. The lowering of the ground level, the low height of the proposed roof, the high level of the existing fence and the change in levels with next door suggest that no light will be blocked for the neighbours at 34 Heathwood Gardens. The clients do not wish to extend at the rear any further than the depth of the existing wc and although this is only 1.07m it will be enough to maintain a decent sized patio and create an extra metre in which a sofa can be situated to look out onto the garden. In conclusion this design and proposal is modest, understated and elegant – yet it creates and allows for many more improvements inside than simply a 1.3m extension. The proposal enhances not only the lives of the present clients (who live and work there) but also the character of the back garden. This isolated back area will become enhanced, maintained and connected to the rest of the house in such a way to improve the gardens and offer much needed space and light inside the house.